Children’s handprint and footprint crafts make some of the best keepsakes of these early years. They also make great gifts for grandparents! You can make the following crafts by tracing around your child’s hands and/or feet onto construction paper and then cutting out. You can also adapt these ideas for decorating T-shirts by using fabric paints and pens. Let your kids color and decorate their work. Here are three example of craft ideas. Flower: For a flower, trace and cut out your child’s handprints on colored paper. 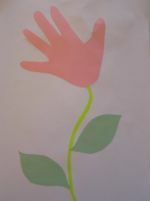 Glue them onto another piece of paper and draw a flower stem with leaves at the bottom of the handprints. Butterfly: For a butterfly, trace and cut out your child’s handprints from colored paper. These will be the butterfly’s wings. Draw and cut out a long oval shape to place between the butterfly’s wings for it’s body. Draw an antenna and face with a black marker . Bird: Trace and cut out one foot and one handprint from your child. Glue the footprint to a piece of paper with the toes facing down and the footprint at an angle. This is the bird’s body and tail feathers. Glue the handprint onto the side of the footprint, with the heel of the hand on the side of the foot. This will be the bird’s wing. Draw or add a colored beak and eye to your bird.